How does gibbssports.com use information about me? Does gibbssports.com share my information with third parties? Whenever you browse the gibbssports.com website, Gibbs automatically receives and records information, such as your IP address, browser type, domain name and specific gibbssports.com web pages that you click on. This information is in the form of aggregate data, historical data, tracking data, navigational data, and click-stream data that does not personally identify you. This information is collected through “cookies,” and “web beacons,” which are described in more detail below. We collect personally identifying information such as your name, home address, email address, and phone number from you when you visit gibbssports.com if you supply that information. For example, but not by way of limitation, if you submit a question to customer service through the gibbssports.com website, we may need your email address to respond, and you may also provide us with additional information to help us answer your question. If you provide such personally identifiable information, Gibbs will provide you with an ability to opt-out of certain uses of such personally identifiable information. Gibbs complies with the Children’s Online Privacy Protection Act of 1998 (COPPA). Gibbs does not knowingly collect contact or personally identifiable information from children under 13. The gibbssports.com website is not intended for use by, or to solicit information of any kind from, children under 13. The primary purpose for collecting personalized information is for gibbssports.com to provide a safe, efficient and beneficial online experience. We may use your personal information for the purpose of improving our services and our website’s content and layout, to inform you about future marketing, service updates, communicate your indicated preferences, and to verify other information. gibbssports.com may also use your information to provide services and customer service, as well as to correct problems and resolve disputes. When you browse our website, we collect information on your IP address, browser type, domain name and specific gibbssports.com web pages you visit. This information is used in aggregate to help us look for trends so that we can improve our website and your gibbssports.com experience. gibbssports.com may also use third-party advertising companies to place advertising on other websites. These advertising companies collect anonymous information about your visits to these websites or interaction with our email through the use of “web beacons.” This technology allows them to use information about your visits to help us serve you better. gibbssports.com also uses web beacons to review how visitors navigate our website or interact with our email advertising. Additionally, gibbssports.com may also share your personal information with outside companies that perform services specifically for gibbssports.com. For example, we may retain an outside company to create and distribute a direct mail or email offering. In these situations, the outside company is performing the work for gibbssports.com. gibbssports.com takes appropriate steps to ensure your privacy and that your information is used only to provide the services requested by us, and not for other purposes. gibbssports.com reserves the right to disclose information about you, as required by law, in response to legal process and law enforcement requests, and as is necessary to protect the property, interests and rights of gibbssports.com, its affiliates and others. Cookies are not required for you to browse our site. Cookies can be modified or disabled through your browser options. “Web beacons” or “spotlight tags” are electronic images (also known as “single-pixel gifs”) that enable gibbssports.com to count the number of times a page has been viewed, or to access cookies. Web Beacons do not collect personal information about users of the gibbssports.com website. Web Beacons are used only to compile aggregate, anonymous information about use of the gibbssports.com website. gibbssports.com’s website may contain links to other websites. You should review those websites’ policies before providing any personal information, as we do not control the privacy policies or practices of these websites. gibbssports.com provides links solely for the convenience and information of our visitors. We do not share your information with other parties. The pictures, videos and text on www.gibbssports.com depicted PROTOTYPE products NOT available for sale. The demonstrations involved professional operators under controlled conditions. DO NOT ATTEMPT. 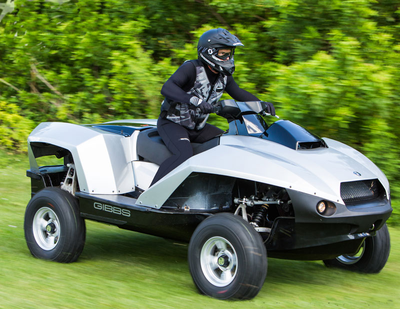 GIBBS recommends that all operators take personal watercraft (PWC) and all-terrain vehicle (ATV) training and safety courses. Failure to follow safe riding practices can result in SERIOUS INJURY OR DEATH. ALWAYS use common sense and operate with caution, ride within your limits, operate at a safe speed and safe distance from other vehicles and watercraft and wear appropriate safety gear. NEVER operate a Quadski while under the influence of alcohol or drugs, overload a Quadski or allow anyone under the age of 16 to operate a Quadski.